Nick Maggiulli who writes a wonderful financial blog called ofdollarsanddata, posted a piece this week that really caught my eye. Titled, Why The Best Predictor of Future Stock Market Returns is Useless, the post deals with a very interesting indicator of stock market returns -- the average investor allocation to equities. Basically when investors exceed the historical average, allocating say 70% or more of their funds to stocks, equities perform poorly over the next 10 year. When the allocation is below the historical average the performance is much better. Start by investing in stocks (S&P 500). When demand gets too high (>70% average equity allocation) => sell your stocks and move into bonds (5yr Treasuries). Stay in bonds until demand gets too low (<50% average equity allocation) => sell your bonds and buy back into stocks. That’s it. I chose the 70% upper limit and 50% lower limit to have round numbers that also corresponded to different return regimes (aka I data-mined this using backtests). 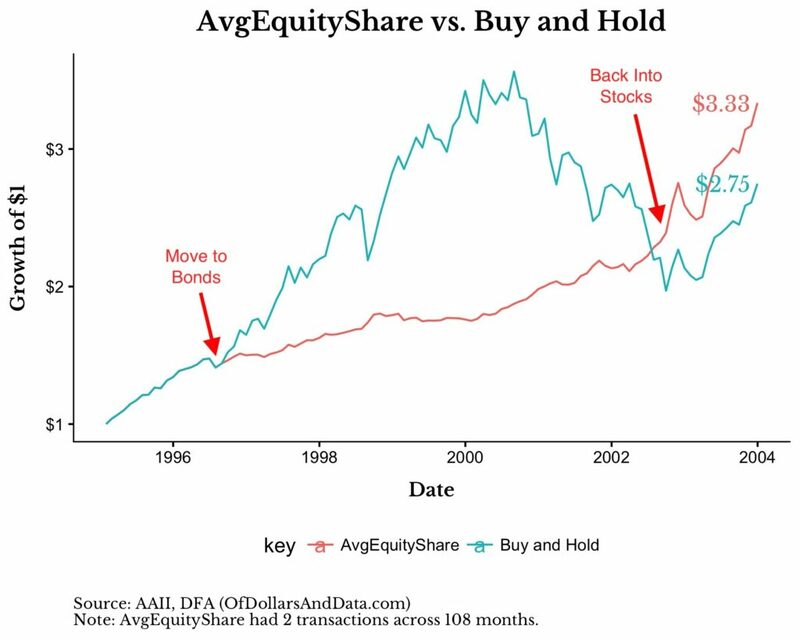 If you run this model you will find that from 1987 to 2018, $1 would have grown into $43 compared to only $24 for “Buy and Hold” (almost 2x better dollar growth), with a far better drawdown profile -- the AvgEquityShare model is half (-23.2%) of what “Buy and Hold” delivered (-50.9%). He then presents this chart that basically shows you would have to give up the massive run up from 1996-2002 in order to follow the model properly. No doubt he has a point. FOMO is a very powerful emotion that can seduce us all into some very bad decisions. Ask anyone who bought Bitcoin at $16.000 or Ripple at 3 bucks. But let’s step back and analyze his point. Can you really argue that buy and hold is better? Will anyone really be able to hold through a 50% decline and continue investing for the long run? 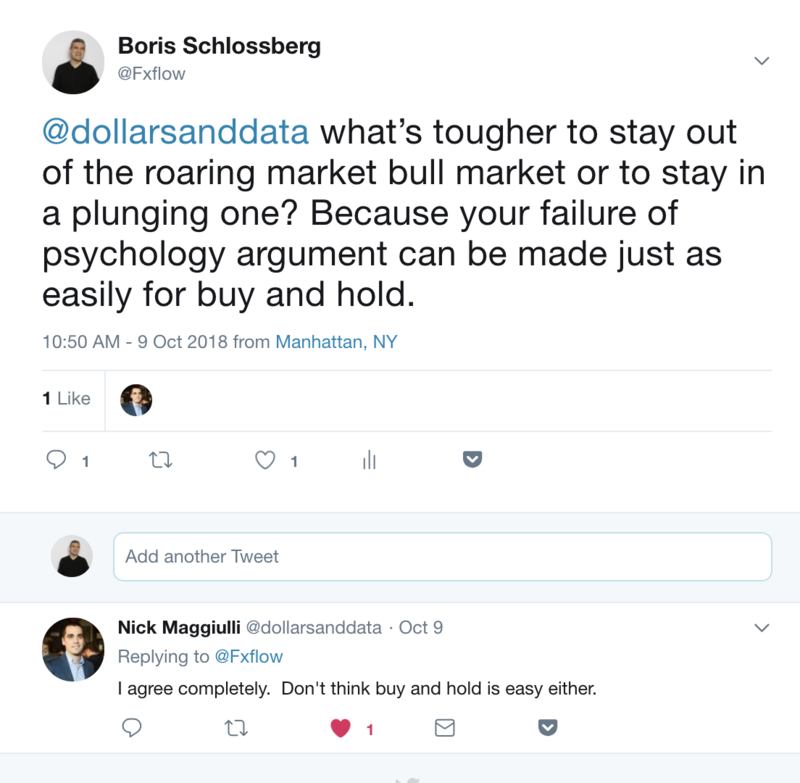 But Nick’s column really made me think because what it really demonstrates is the need to truly understand your trading premise before you ever push the button. In short, you need to know the trade before the trade. In Nick’s model, the success of the AvgEquityShare is obvious under even the most cursory examination. It makes nearly twice as much money with 1/2 the risk. It’s clearly superior to the Buy and Hold. But it comes at a cost of staying out of the market for long stretches of time. Yet, if you knew ahead of time that those are the costs, wouldn’t you be much better prepared to sit out the manic runups? I have a new day trading strategy that trades trend on the 1M chart. But it only works if I follow a very specific set of rules. So, for example, today I missed the 70 pip move in USDJPY and yesterday I missed the 120 pip move in the pound. But that’s ok. The strategy is never meant to capture those type of moves. I make my 20-25 pips when I can. I keep my risk very low and I grind away trying to make 200 pips net each month, comfortable in the knowledge that the strategy is doing EXACTLY what it is supposed to do. And for me, that is the true lesson of Nick’s column. It’s not the strategy that matters, it’s having the proper expectation for that strategy. In fact, I would argue that 90% of all our failures as traders ( certainly 90% of mine) are due to the fact that we woefully misalign our expectations and our strategies. That’s why fully understanding the “trade before the trade” is perhaps the most important strategy of all.